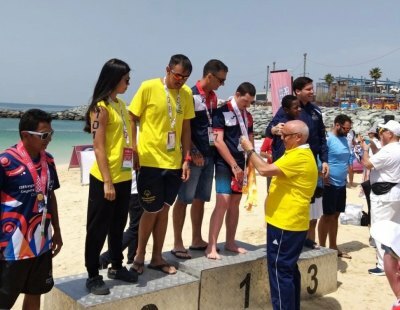 Special Olympics Gibraltar athlete Adam Stewart struck gold for the team on day one of the Special Olympics World Summer Games in Abu Dhabi when, with unified partner Darren Grech, he came in first in the no wet suit category, 1 mile open water swim. In the event, held in Dubai, Adam clocked 29.13 minutes beating competitors from Brazil, Costa Rica, Uruguay and the Cayman Islands. Under the coaching of Mark Chichon, Adam and Darren had been in training since last August in the waters around the Rock. The victory marked the first medal for SO Gibraltar in these games and was a great start on the first day of competition. 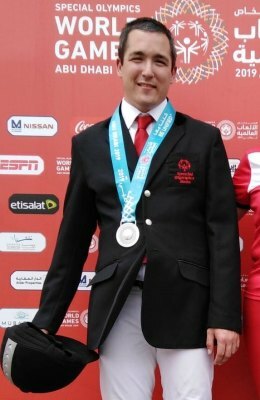 Years of training in the sport of bocce paid off for Dorian Zammit who brought home the gold medal in the men's singles event. The pride felt by his parents, who are present in Abu Dhabi for the games, was compounded when his brother Marvin also then went on to win gold in the men's singles bowling event. Whilst different events, the skill shown by both brothers was evident. In bocce Malcolm Miel came 5th in his division of the men's singles, whilst Marvin's teammate Samyr Anakkar claimed a bronze in the men's singles bowling event. Shane Martinez came away with a 5th place ribbon, also in the men's singles bowling.